ROUND ROCK, Texas - A Taylor Jones three-run homer made the difference in Sunday's back-and-forth matinee contest between the Round Rock Express (7-4) and Memphis Redbirds (4-7). Seven Chupacabras batters collected at least one base hit in the 7-6 victory. Chupacabras RHP Tanner Duncan (1-0, 4.50) earned his first career Triple-A victory after allowing three runs, only two of which were earned, in 2.0 innings of relief. LHP Framber Valdez recorded a hold after allowing only one hit and one run while striking out two in his 2.0 inning relief appearance. 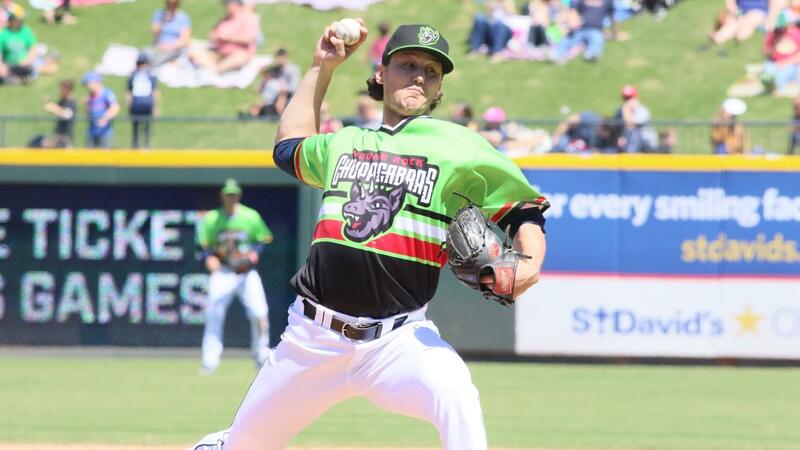 Round Rock RHP Ralph Garza earned the save, striking out one batter in the ninth inning. Redbirds LHP Ryan Meisinger (0-3, 7.56) suffered the loss after allowing three runs on four hits and two walks in 1.1 innings of relief. The Redbirds struck first in the top of the third after SS Ramon Urias walked and advanced to second after DH Edmundo Sosa sent a line drive into right field for a single. An RBI single by 2B Tommy Edman plated Urias and gave the visitors an early 1-0 lead. 2B Alex De Goti answered right back for the Chupacabras, launching a solo homer into left field in the bottom of the inning. Redbirds RF Adolis Garcia followed De Goti's lead by hitting a home run of his own into left field, putting Memphis back on top 2-1. RF Kyle Tucker started the fourth with a walk, preceded to steal second, and eventually make his way home thanks to an RBI single from LF Yordan Alvarez . For Memphis, Garcia responded with an RBI double that would drive home LF Lane Thomas , who reached base on a Jack Mayfield fielding error prior to a Rangel Ravelo single to right field. The pair had advanced to second and third when 1B John Nogowski grounded out. The back-and-forth contest continued into the sixth inning when DH AJ Reed fired a single into left field, and advanced to second on a Ravelo fielding error. The designated hitter raced home after C Jamie Ritchie singled, and later stole second. With two outs, CF Myles Straw sent an RBI single into center field to score Ritchie and tie the game once again, this time at four. Memphis would quickly take back the lead when Sosa scored on a Thomas sacrifice fly after sending a double into center field and advancing to third when Edman flew out to right field. A big sixth inning led the Chupacabras to a win over the Redbirds. Mayfield reached base due to a fielding error by 3B Max Schrock before heading to second after Alvarez was walked. Jones then cleared the bases with a three-run blast into right field to put the Chupacabras ahead of the Redbirds 5-7. Memphis would come within 7-6 after Nogowski, who previously doubled and advanced to third on a Garcia sacrifice bunt, touched home as Schrock grounded out. A one-run deficit proved to be too much for the Redbirds to overcome, while the Chupacabras defense held on to take the victory. The Chupacabras transform back into the Express on Monday, aiming for their third straight series win in game four against the Redbirds. The Houston Astros top prospect, and number one pitching prospect in all of baseball, RHP Forrest Whitley (0-1, 3.60) is scheduled start opposite RHP Jake Woodford (0-0, 0.00). First pitch on Education Day at Dell Diamond is set for 11:35 a.m.